Summary: What is MobyMax? MobyMax is a feature-rich adaptive classroom technology tool that will help students, teachers and administrators set, track and monitor the goals of their students. This assistive technology tool is a very useful educational software that will effectively provide the support that all students need to be successful. Mobymax makes it fairly easy to monitor the skills that students will need to be successful. the bottom of the student’s screen that you, as a teacher, can control which allows your students to see precisely which skill they are working on. Many students have indicated that they like to have it at the bottom of the screen. If they are used to seeing that indicator, they will ask you about it. This display of standards also helps the teacher to easily monitor student work. Downloadable worksheets are available to provide off-screen practice for students. MobyMax can effectively help to differentiate your lessons to target student skills at the levels that they are on, so that they can feel successful. There are built in motivation for students to keep them going: Badges and other features are available for students to accumulate, creating a sense of reward and accomplishment from completing tasks on the platform. Parents can also be involved in the entire process so that they may help to motivate the students. Built in tracking and reporting, such as graphs and tables, help teachers easily monitor to make sure students are staying on task and mastering the tasks that you have set for them. It is very affordable: Mobymax is free for a single teacher without reporting. However, if you want to see reports,set progress and effectively monitor the performance of students, you will have to pay $79 for a single teacher license. On the other hand, an entire school license can be obtained for $499 per year. This web-based program means there is no time limit as to when resources can be accessed by students and teachers. get a clear view of the classroom and design strategies for the students to be successful. There is a very large user-base: mobymax.com/motivate. The students find the games pretty boring-no pictures, characters, etc. Tutorials just give students the answer, in words, without explaining step-by-step. Students are not able to use manipulatives when completing practice sessions or tests. The tutorials are not very expansive, therefore, this may not be the perfect early childhood technology tool for lower elementary kids who are just beginning to learn concepts. MobyMax provides mostly assessment-worksheets on the computer. MobyMax is great software for upper grades and for skills practice. This is probably not the best software for when lower grade students are actually learning concepts, however, it can provide adequate support for the teacher when used carefully throughout the learning process. The assessment tools that the software provides make it a great assistive technology in the classroom for any teacher and school administrator. Given that MobyMax aligns directly to the Common Core Standards, and given the pricing structure, it makes for a very efficient use of technology resources in the classroom. MobyMax can easily replace or supplement many of the technology that is already available in a modern classroom. The fastest way to increase test scores is to help students learn missing math and ELA skills. MobyMax's comprehensive learning system automatically diagnoses areas of weakness, assigns targeted lessons to improve those areas, and tracks progress as students master skills. 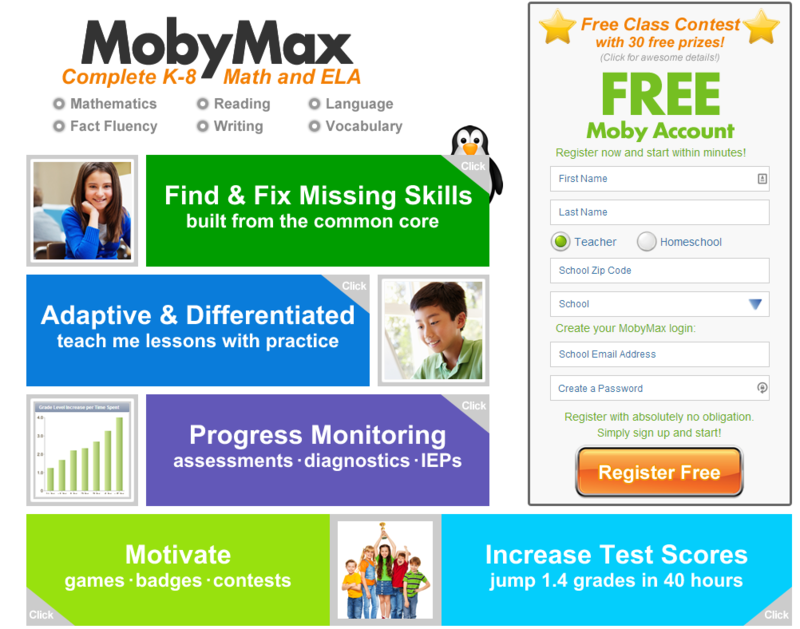 MobyMax's test prep further improves student performance to dramatically increase test scores. MobyMax diagnostic, formative, and summative tests find missing skills. Then, Moby's adaptive curriculum creates a unique, individualized education plan for each student, ensuring that students get the instruction they need. Data and goals are essential for increasing scores. MobyMax shows your students' current grade level proficiency as well as how fast your students are learning. The students' learning velocity allows you and your teachers to make sure students are on track to meet their goals. The final step in improving state test scores is state test prep. For test review, MobyMax pinpoints areas of mastery with a short review and targets areas where help is needed for more practice. The adaptive review means students do not waste time practicing material they have already mastered. Students increase their scores and confidence with just two weeks of practice and review! As a teacher, I am of the opinion that standardized tests are a complete waste of time and resources. However, the politicians will not do anything unless the parents decide to take back the schools from the corporations and the corporate controlled politicians who are trying to privatize the entire process. What is the relationship between the way students are assessed in primary-secondary schools versus the way they are assessed in college? In college, students are assessed per semester, therefore, there is no need for students to be tested on content that they learned at the beginning of the year. It is not a secret that that public school teachers are in the bulls-eye. Heck, even some of the most harden-hearted people out there believe that teachers get no respect whatsoever, because of the way teachers have been attacked. Are the “banksters” who control the global economy as scrutinized as public school teachers? It was quite refreshing as a public school teacher to see parents in Seattle standing up for their teachers, letting their opinions be known about standardized tests and the evaluation of their teachers. A small but growing number of parents nationwide are trying to ensure their children do not participate in state standardized testing, citing a myriad of reasons including the stress they believe it brings on young students and a discomfort with the tests being used to gauge teacher performance. Some have referred to it as an act of “civil disobedience” that is beginning to gain momentum. Read more here on the article that describes the way parents in Seattle are backing up their teachers. What do you think will happen in poor communities when teachers decide to move to areas where they think there is a better community to work with? Will you as a teacher move to a neighborhood to teach that has a reputation of poor parent support and low performing students? Most urban schools will pay you extra to come in and teach there. This additional income has come to be known as “combat pay”. Will more poor performing schools and districts start offering combat pay to lure teachers? Am I saying that teachers should not be evaluated and held accountable for the performance of their students? Absolutely not! However, it is not as simple as the leaders want to make it out to be. There are many factors that affect a student’s performance in school. There are just some families and communities that take education more seriously. Those students come to school more motivated and are ready to learn. That is the kind of student that makes you feel good about going to school, and the type of student that made you want to be a teacher in the first place. 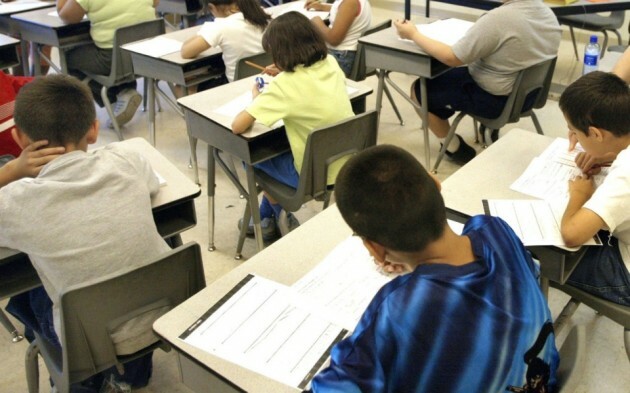 At the end of the day-learning-is-learning, and there is no need for students and teachers to be subjected to these standardized tests that cost billions of dollars when the economy is changing at such a rapid rate. No longer are students being trained to work in factories. Students should be assessed based on what they are able to do, and the problems that they are able to solve. This controversy is far from over, and at the end of the day, it is the parent who will decide the direction in which we are going to take, whether or not that parent knows what the heck is going on.